In 1978, the United Presbyterian Church in the U.S.A. approved a minority report from the Task Force to Study Homosexuality. The report prohibited presbyteries from ordaining homosexuals while also calling for educational initiatives to reduce homophobia throughout the church. 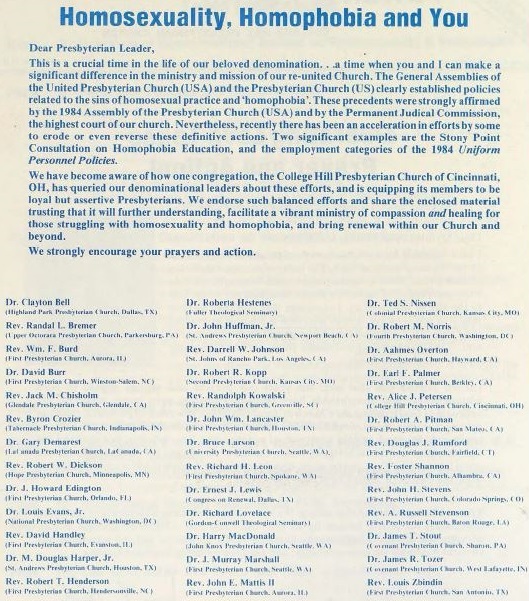 The UPCUSA General Assembly spoke out in 1980, again urging congregations, presbyteries, and synods to form educational efforts to eliminate homophobia, initiate dialogue with gay and lesbian Presbyterians, and advocate for civil rights. The Program Agency--a predecessor of today's Presbyterian Mission Agency--developed an Education Project on Homophobia in response to these calls. In September 1984, the agency sponsored a Consultation on Homophobia to discuss how to develop educational resources for churches. Seventy participants gathered in Stony Point, New York, including presbytery staff, pastors, elders, and members of Presbyterians for Lesbian and Gay Concerns (PLGC). For two days, they listened to presentations on theological and ethical concerns, held bible studies, and broke out into frequent discussion groups. The general attitude that pervaded the conference was welcoming toward gay and lesbian Presbyterians. A Presbyterian Church (U.S.A.) press release stated that “the project assumes that the church can and should become more graceful in its ministry with gay and lesbian persons, that the church is diminished by their exclusion, and that talented leadership for the work of ministry should be welcomed without regard to sexual orientation.” Participants called out the PC(USA) for contributing to homophobia by refusing to grant gay and lesbian Presbyterians full inclusion in the church. The conference also developed educational strategies for reducing homophobia throughout the PC(USA). Attendees divided into ten elective interest groups to brainstorm initiatives, including Special Presbytery Ministry with Gays and Lesbians; Working Educationally to Combat Heterosexism; Learning from More Light Churches; and Sexism in Relation to Gay and Lesbian Liberation. The Program Agency circulated the results of these discussions, but encountered strong objections from some church members. 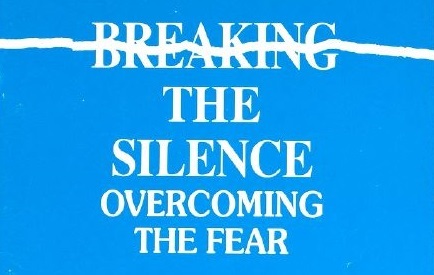 In 1985, a group of over twenty-five concerned church leaders, organized by College Hill Presbyterian Church (Cincinnati, OH), wrote a report titled “Homosexuality, Homophobia, and You.” The report critiqued the consultation, arguing that it conflicted with the recent General Assembly mandates that labeled both homophobia and homosexuality as sins. The report also spoke against a possible revision in the General Assembly Uniform Personnel Policies that would list sexual orientation as a special protected category. Church & Society, vol. 73, no. 2 (November/December 1982). The theme, "Homophobia: The Overlooked Sin," is in response to the policy statement regarding homosexuality adopted at the 190th General Assembly of the UPCUSA. Weekly news wrap-up, October 1984. A wrap-up of news around the church from the week of October 5, 1984 that features the story, "Presbyterian Church Leaders Discuss How to Counter Fear of Lesbians, Gay Men," by Dennis E. Shoemaker. Connections Conversation Piece newsletter, April 1985. Provides differing reactions to the Consultation on Homophobia.